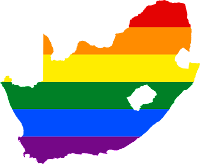 IntLawGrrls: South Africa Constitution's sexual orientation equality provision at risk? South Africa Constitution's sexual orientation equality provision at risk? The progressive reputation of the South Africa Constitution is well-deserved, and it is based in part as being the first Constitution to explicitly recognize equality on the basis of sexual orientation. But the inclusion of sexual orientation has re-emerged as a controversial issue. De Vos' analysis is worth reading in full. Coupled with recent controversies surrounding the composition of the South Africa Constitutional Court, about which I posted a while back, this is alarming news indeed, and threatens South Africa's status as a constitutional democracy that is "one of the most progressive in the world."